SINA aka Barry Gordon is a musician and producer from Belfast, Northern Ireland. Fascinated by music from an early age he was intrigued and inspired by his fathers extensive and eclectic vinyl collection which contained many diverse genres of music, from Latin and African rhythmic music to folk, gospel and jazz. As a teenager he taught himself to play several instruments, learned musical theory and played in various local bands before being introduced to sampling techniques and computer sequenced music. 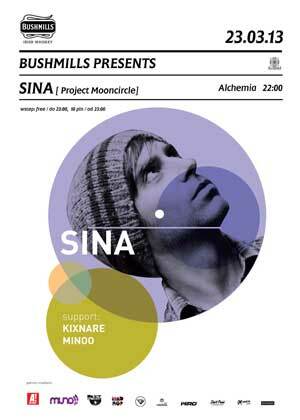 He debuted his first original compositions under the name Sina. in 2009, and after releasing several well received netlabel EPs, is set to release his first proper EP through Project: Mooncircle on November 5th 2011. KIXNARE Polish hip-hop producer best known for his remix of the 2005 J-Live album The Hear After. Kixnare comes from Czestochowa but it is in New York sounds that we feel at home. He became better known after producing some tracks for Grammatik, Smarki Smark, Te Tris , Eldo, Szybki Szmal and „Junoudet”. He remixed whole J -Live’s album and lot’s of other stuff from the golden era. Minoo – musical project from Poland, chiefly, revolves around experimental hip-hop and electronic.In 2011 released album White Mice in Asfalt Records (one of the most prestige hip-hop label in Poland) on vinyl and extra on a cd. In the material we can find always changing proportions – sometimes hip – hop is going into back stage and it is covered by some different motives, and in the other time it is dominating. Minoo has been bound up with many organizations related to art in Poland. He supported The Five Corners Quintet (Freeform Festival), Flying Lotus(Tauron Festival) and many others.His live acts attempt to join modern electronic sound based on hip-hop bits (with elements of dubstep, glitchhop). Rooms to rent located on Szeroka street, an amazing wide, cobbled square in the very centre of the old Jewish quarter - Kazimierz. This café, the only one of its kind, has a garden in the Planty park which is open throughout the year. A splendid place to get some work done on a laptop, read a good book or chat about business. © 2019 Klub Alchemia, Fundacja Dom Kultury Alchemia. All rights reserved.